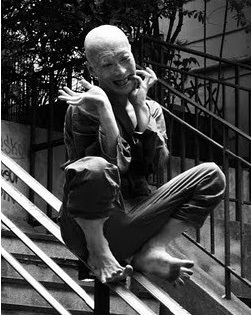 Butoh is an avant-garde dance movement born in the late 50's in Japan. The founders of Butoh like Tatsumi Hijikata or Kazuo Ohno focused on the abandoned part of our body in the process of their work. They considered that all the movements treated as "negative" elements could be included in the dance. Such as madness, illness, awkwardness, weakness, foolishness, chaos, nothingness� Through the movements of the dancing body, they made a research about the relationship between the body and natural phenomenon, life and death, soul and body, order and chaos, purity and dirt, humanity and non-humanity, reality and imagination, visibles and invisibles, daily life movements and dance, holiness and banality� In the workshop, we will make a research with our own body inspired by their point of view on the human body and on the relationship between the body and its environment. Each participant will observe his own body as a unique space of laboratory where any kind of movements can happen and go through. I hope that we can touch the mystery of our being through the dance and that a new Butoh dance will be born through our actions. Please find the information below about butoh workshop (and the performances) that I will give in Leipzig and in Freiburg in October. It will be a pleasure if we can meet again for this occasion. Der Butoh Workshop mit Gyohei Zaitsu ist am 8-9 Oktober im Westwerk, an beiden Tagen 12-19 Uhr. Es gibt 15 Plaetze und kostet 35 Euro pro Tag. Gyohei wird eine Butoh Performance am 11 Oktober um 21 Uhr im UT Connewitz geben, begleitet von live Musik mit Monsieur Scary, experimental, atmosphaerische Musik mit Circuit Bent Ger�te. This even websitet is programmed by the Centre for Contemporary and Digital Performance and supported by the Brunel University Graduate School, Goethe-Institut London, and DAIWA Foundation Japan House.